MEXICO CITY — Experts called on Mexico's government Wednesday to use floating barriers to enclose a small area of the Gulf of California where a half dozen critically endangered vaquita porpoises were spotted in September. The sightings were an unexpected mix of good and bad news for the world's smallest porpoise, which has been driven to the brink of extinction by nets set illegally to catch totoaba, a fish whose swim bladder is considered a delicacy in China. 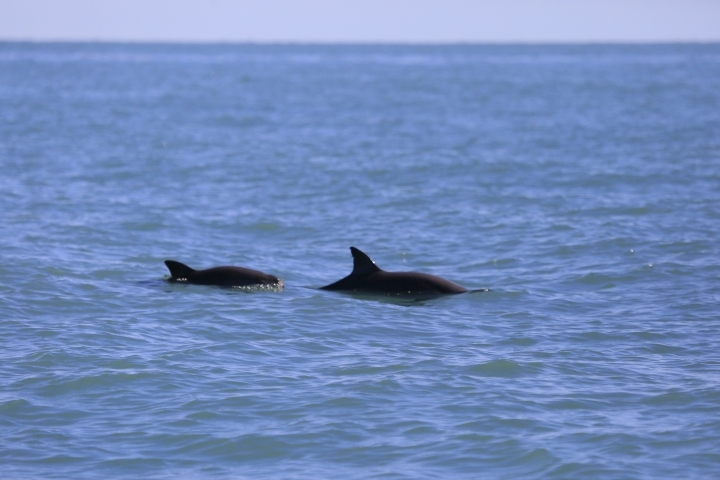 One of the porpoises was identified by experts as Ana, a mother that was spotted with her second new calf in two years. Vaquitas usually have only one calf every two years. "This means the rate of recovery could be double" what was previously thought, said Lorenzo Rojas-Bracho, who has led an international team of scientists working to save the porpoise. "If we stop killing them, they will recover," he said, noting that other endangered animals like the California condor have been coaxed into recovery from extremely low population numbers. But a network of acoustic monitoring devices that listen for the "clicks" made by vaquitas to navigate indicate they have essentially disappeared from about 86 percent of their historic range in the Gulf of California. Armando Jaramillo, an expert from the National Ecology Institute who oversees the acoustic program, said 50 percent of all underwater "clicks" detected this year came from just four monitors, out of 46 that once detected them. "Nowadays we hear very, very few vaquitas," Jaramillo said. Alejandro Olivera, the Mexico representative for the Center for Biological Diversity, estimated only about 15 porpoises remain, which would be in line with a 30-individual estimate from last year. The species has been collapsing at a rate of almost 50 percent a year. That might mean the six or seven vaquitas seen from the ship Narval on Sept. 26-28 were about half of all those still alive. Official estimates aren't due out until January. Jaramillo sees a silver lining — or a last chance — in the fact that most of the remaining vaquitas have been reduced to such a small area, roughly a 12- by 25-mile (20 by 40 kilometer) rectangle. "Now we have a zone that is relatively smaller and easier to protect," he said. Diego Ruiz, head of the Baja California Sur-based Museo de la Ballena, has proposed erecting a barrier of buoyant tubes supporting above-water nets that wouldn't restrict the vaquitas' movements but would keep small fishing boats out of what may now be the species' last habitat. Some experts also are suggesting stationing a navy ship permanently in the middle of the vaquita's last refuge. "If we don't stop illegal fishing, they could become extinct in a year, or the year after," Jaramillo said. Because the totoaba bladders are trafficked for big profits in China, efforts by the Mexican navy to prevent illegal fishing have faltered. The illegal fishermen, who are believed linked to drug cartels, use go-fast boats and have resorted to violence — shooting down drones with rifles, running their boats into navy patrols and threatening activists. Jaramillo says the incoming government of President-elect Andres Manuel Lopez Obrador, who takes office Dec. 1, should also focus more effort on shore patrols to keep illegal fishing boats from setting to sea and to break up the trafficking of totoaba parts on shore. However, Lopez Obrador has pledged to create jobs in rural areas so Mexicans don't have to migrate, and he is under pressure from fishermen who want to get back to work. The current administration expanded and enforced a widened ban on the use of gillnets that kill vaquitas by drowning them but are also used by fishermen to catch a variety of shrimp and fish beside the totoaba. Some in the incoming administration seem ready to write off the vaquita. Josefa Gonzalez, who will head the Environment Department under Lopez Obrador, said in an interview with the newspaper La Cronica earlier this year that a lot of money has already been spent on the endangered porpoise with no results. "I don't think the vaquita is going extinct; it has already been driven to extinction by negligence and corruption," she said.